The 1966-67 ski season was the first for the Waterville Valley ski area and I was a junior at the University of New Hampshire. My first visit to the new area made a big impression on me because everything was new! The relatively few ski areas I had visited were old and their facilities looked it. However at Waterville Valley everything was new: the base lodge complex was new, the lifts were all new, the staff uniforms were all new, even the access road was new. 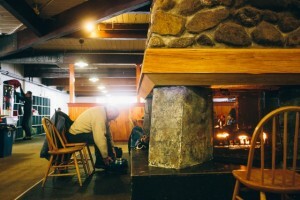 I remember going into the Waterville Valley base lodge which had carpeted floors – not common at that time in base lodges – and chairs more like you’d find in somebody’s dining room. We felt uncomfortable putting our ski boots on in such nice surroundings. Waterville Valley is situated on 4000-foot Mt. Tecumseh. In 1934 the CCC built a ski trail on the mountain. This trail would be refined by the CCC in later years and become a popular race trail in the 1940s. As lift-served skiing became popular, the inn at the base of the mountain added a small rope tow. However the development of Mt. Tecumseh into the Waterville Valley ski area would have to wait for Tom Corcoran. Corcoran was a Dartmouth educated ski racer who raced for the United States in two Olympics. 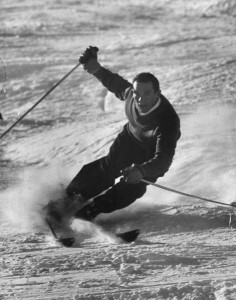 He finished just out of the medals in fourth place in the Giant Slalom at the 1960 Squaw Valley. It wouldn’t be until 2002 that an American male skier would have a better Olympic GS result. Corcoran would get an MBA from the Harvard Business School and then go to work for the Aspen Ski Corporation. There he became friends with the Kennedy family and particularly Robert F. Kennedy. 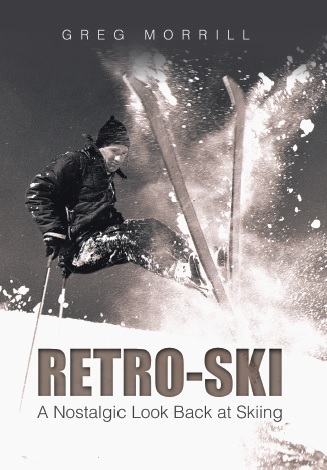 In 1965 with the Kennedy’s backing, Corcoran was able to obtain financing to develop the Waterville Valley ski area. Corcoran would remain true to his racing background and make Waterville Valley a popular race destination. Waterville would host 10 World Cup races under his leadership. That included the 1969 World Cup finale where the overall World Cups were awarded to Karl Schranz and Gertrud Gabl. I was a gate-tender at that 1969 World Cup finale. Waterville had a program with the UNH Outing Club to get volunteers to be gate keepers. Not just for World Cup races, but for all the races they hosted. For every day you gate-tended, you got a voucher for another day of skiing. In 1969 I was working at IBM in Burlington, but still had enough UNH connections to land a gate-tending spot. It was special to see the great racers of that era close-up and personal. 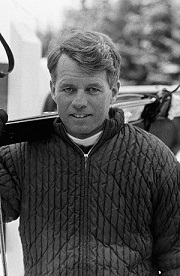 Another aspect of skiing at Waterville was the opportunity to “celebrity watch” – particularly the Robert F. Kennedy family and their various guests. Bobby Kennedy was a respectable skier and didn’t like to stop. I don’t know if that was to keep unwanted paparazzi away or not. However it did present a challenge to his many kids who tried to keep up with him. The older ones could almost keep up, but the smaller ones were scattered along the trail. More than once we had to help a small Kennedy get their equipment back on and point them down the hill. I still highly value the thank you I received from Bobby for helping the kids. After his untimely death in 1968, the area added Bobby’s Run in his memory. 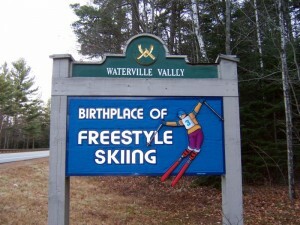 Waterville Valley also played an important part in the development of freestyle skiing. In 1969 the area was the first to offer a freestyle program and in 1970, Tom Corcoran would help organize the first National Open Championships of Freestyle Skiing. Tom Corcoran actually skied for Mt. Mansfield Ski Club for 3-4 years in the late 1950s-1960 timeframe. Not sure of the details, but I think Sepp, CV Starr, and the club were helping to fund a few top athletes as we approached the 1960 Olympics). There were several other top skiers of that time also skiing for MMSC (Sally Deaver, Les Streeter, …). Check this link, and you see that Tom was in fact affiliated with MMSC when he was competing in the 1960 Olympics.